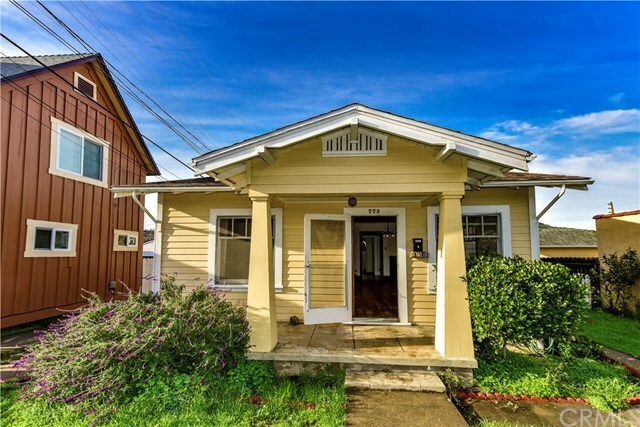 Historic 3 bedroom 1.5 baths 1925 bungalow. Views of Madonna Mountain throughout the home and from the private backyard. Located in the highly desirable Mill District neighborhood. Just a few blocks to downtown and easy access to highway 101 for your daily commute. Stepping in through the front door the first things you notice are the wood floors and wood sash windows allowing an abundance of natural light. Try the hand crank twist doorbell as you enter! The kitchen offers original built-in cabinetry and farm sink. The laundry room leads to the backyard where you'll find green grass and 100-year old roses beside the detached single car garage. The bedrooms have two large windows each and the master has a beautiful glass door to the outside. Don't miss the clawfoot bathtub in the full bathroom and the 1/2 bath has plenty of room to add a shower to make another full bath. This property needs TLC but has so much potential. Or tour the property anytime with your REALTOR!